So as I keep banging on about I'm making the move to London in December ready to intern with Anna Scholz and New Look Inspire so full time work in a call center has taken over my life. I only have 6 weeks left but my weeks have been consisting of 7am wake ups, lots of energy drinks, catching up on sleep and repeating this cycle continuously. My mum received a money off thing for very.com and I've been wanting a disco pant dupe (this is the only site I've found them on in a size 20) so I took this as my chance to purchase. 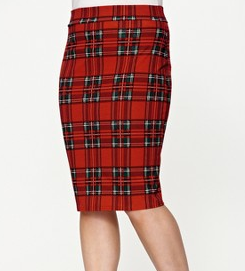 Along with the disco pant dupe I took the chance to purchase this tartan pencil skirt and this pu sweatshirt dress. I love quirky one off pieces and with this being black I'm sure I can dress this in many different ways. I've also purchased these suspender tights to team with the sweatshirt. I'm seeing Nicki Minaj (AGAIN) in two and abit weeks so I think this dress could be ideal to lead me from pre concert drinks to the concert to a night out perfectly. oooh are they like the AA disco pants!? I've been looking high and low for something like the AA ones, I think Karmakoma had a pair of leggings that were similar but nowhere else since. Yes. A friend of mine got them and said they are just as good as the aa leggings themselves. They havent arrived though for me to judge. I purchased a matt legging from asos curve but they were a standard shiny looking legging. This is the first aa dupe I've seen in a plus size size anywhere including on ebay.